Enter Iview properties like name, ID prefix etc…as shown below and click next. Iview summary will be shown to you. Click finish. Select open the object for editing radio button to open for editing its properties. There is a property called “path to document”. Change that to whatever path you want. The path should be available in KM. by default this property will have some value as shown In below figure. Select the part after docs. In our case it is documents/Test.txt. Copy documents/Test.txt and put it in the ‘path to document’ property as shown below and click on save button. 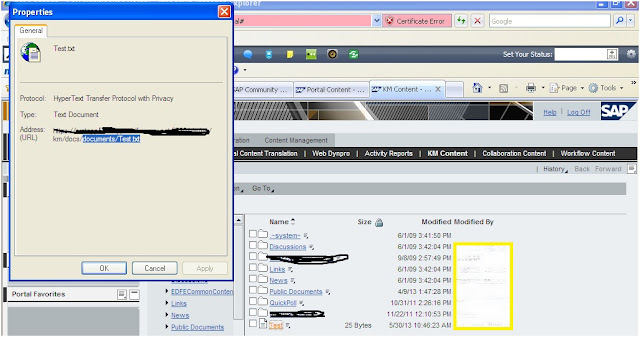 Click on the Preview button and the text document you had created in KM will be displayed in preview. 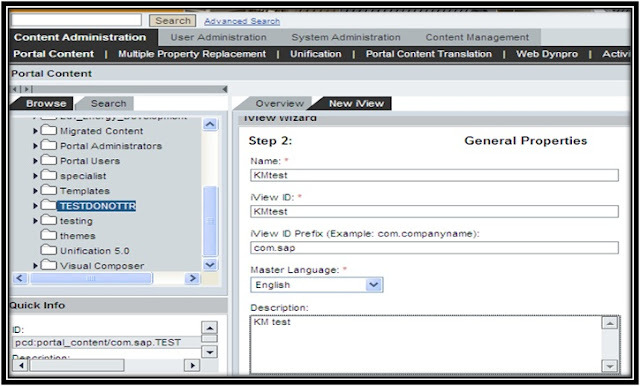 This Iview which displays a KM document can be used anywhere in web applications hosted on portal. For example you have a .Net application where you want to display a document stored in KM, you can create a link on .NET page and link it to the KM document iview created above.